In the Dragon Ball Super manga the kaioshin mentions Super Saiyan Blue Vegito is as strong as Beerus. 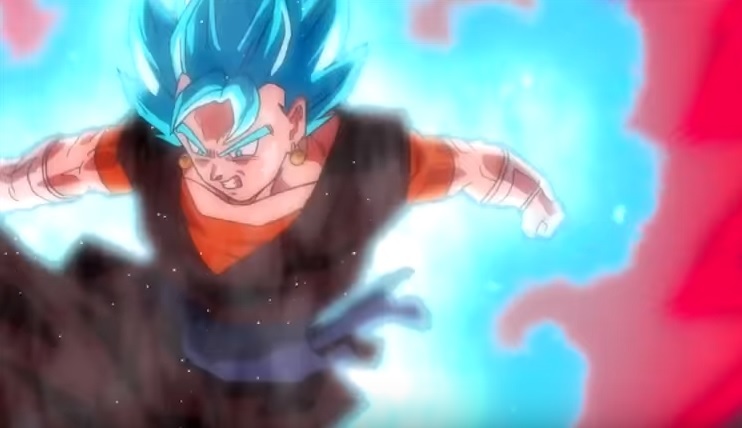 In some Dragon Ball Heroes animation (which I'm not sure if it is a preview of the anime, or an animation from the videogame) we see Vegito Super Saiyan Blue Kaioken. If this Vegito is as strong as the Dragon Ball Super manga Vegito, that would make him stronger than Beerus and possibly Wiss with the use of the kaioken. Therefore my question is, Is Dragon Ball Heroes Super Saiyan Blue Vegito as strong as Dragon Ball Super manga Super Saiyan Blue Vegito? With regard to Super Saiyan Blue Vegito being as strong as Beerus, this statement of Shin should be disregarded. Shin isn't aware of the full extent of Beerus's power and also is also very inexperienced and lacks knowledge of certain things such as Ultra Instinct which even the other Kais are aware of. For example, In Dragon Ball Z, Shin expected Vegeta to have trouble fighting Pui Pui. He also thought Super Saiyan God Goku had the edge on Beerus during the Battle of Gods arc until the Old Kai told him that Beerus was just fooling around. Also, Beerus was easily able to fight multiple Gods of destruction at the same time in the manga and was one of the last 2 standing, hence making him one of the strongest across the multiverse. Hence, it is impossible to conclude as to whether Vegito Blue is stronger than Beerus. Whis at the same time, is on a whole another level. Whis is strong enough to knock out a god of destruction while extremely suppressed, with a single blow. Mastered Ultra Instinct Goku, who surpassed the level of a God of Destruction wasn't able to take out Jiren with a single blow(Note: Before he broke past his limits). Vegito Blue even with Kaioken without a doubt would nowhere come close to the strength of Whis. Finally, the Prison Planet Saga is set after the Universe Survival arc in Dragon Ball Super and after the Dark Empire Saga of Super Dragon Ball Heroes. Disregarding the fact as to whether the given series is canon or not, the Vegito Blue would ideally be a lot stronger in comparison to the Future Trunks Arc since Goku and Vegeta had gotten stronger and might very likely be on the same level as that of a god of destruction. Not the answer you're looking for? Browse other questions tagged dragon-ball-series dragon-ball-heroes or ask your own question. Why Trunks doesnt turn super saiyan rage in the Dragon Ball Heroes anime?